Even Greater Care During Pregnancy. Contains 56 Tablets. 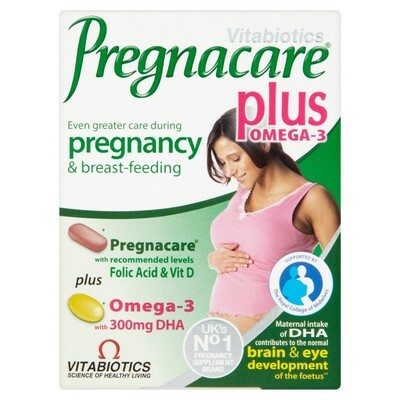 Pregnacare Plus dual pack provides the original fully comprehensive multivitamin tablet, which delivers the essential nutrients for pregnancy including the recommended level of 400mcg folic acid and 10 mcg vitamin D plus an additional Omega-3 capsule to provide a rich source of docosahexaenoic acid (DHA) which contributes to normal brain and eye development of the foetus**.